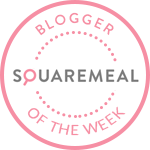 Hawksmoor is without doubt our go-to steak place and we’ve been keen to try their bar menu for months. Then a couple of weeks ago, we saw that they serve a short-rib French dip sandwich. We needed no more convincing and made a beeline for the bar at their Spitalfields branch. The restaurant is close to the Brick Lane end of Commercial road and the bar is actually in the basement. 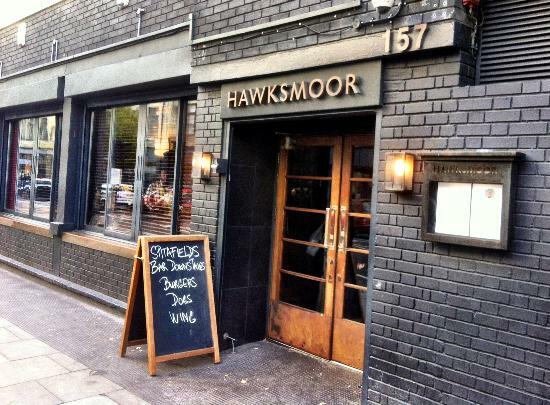 Although all of Hawksmoor’s branches have a different look and layout, they all have a similar feel. This one is all black leather banquettes, white tiled pillars, copper trim and low key lighting. This added to the ambiance but didn’t do much for our photography (as you can probably tell). The short-rib French dip was everything we’d hoped it would be. The braised meat was tender and rich in flavour. It was oozing juice and the melted Ogleshield Jersey cheese was everywhere. In other words, it was messy, cheesy and delicious. It also came with some sensational bone marrow gravy which is used as a dip. For those of you not familiar with a French dip sandwich, the bun is usually immersed in meat juices to soak up added flavour. This didn’t seem to be the case here, although it was so juicy that the bottom could easily have been pre-dipped. The only real disappointment was the kimchi burger. We’re generally big kimchi fans but unfortunately in this case we found it totally overpowering. It was amongst the strongest we’ve tasted and packed too much punch for the beef. After a few bites, we removed the kimchi and ate it on the side. Once we did so, we found the patty to be juicy and flavoursome. It was served in a great demi-brioche bun and although it wasn’t the biggest, it would still have been an excellent burger – minus the kimchi. The short-rib nuggets are pieces of slow cooked beef with a cheesy centre, encased in breadcrumbs then deep fried. They promised so much and while they were tasty, we felt they would’ve benefited from an extra twist of salt. They were served with a kimchi flavoured dip (somebody obviously has a penchant for kimchi) which once again, we found overpowering. This was a real shame because otherwise they would’ve been amazing. They tasted far better when dipped in the gravy from the short-rib but then again, what wouldn’t? We enjoyed the “poutine” but I’m sure it’s disappointed a fair few Canadians. The fries were topped with cheese, rather than cheese curds so it was actually just cleverly branded cheesy chips, topped with meat and gravy. I wouldn’t criticise the dish’s flavour for a second but it tasted too much like the short-rib French dip to be eaten as an accompaniment. By this point we were feeling quite full but we still decided to force down a dessert. These are the kind of sacrifices that pigs have to make. We settled on the sticky toffee sundae and salted caramel Rolos. The sundae was a great choice as it wasn’t too filling and the ice cream meant it was really refreshing compared to what had gone before. The pieces of sticky toffee pudding gave it a good chewy texture and it all worked together well. We’re always drawn to salted caramel desserts and often find that there’s not enough salt. That could never be leveled at the “Rolos” we had here. I still enjoyed mine but the Hog found them way too salty. Although most of the food was really tasty, we feel we could’ve ordered better. Perhaps a plain cheeseburger would’ve been a better choice for us than one with kimchi. The poutine and short-rib bun tasted almost the same so we wouldn’t recommend ordering those together either. There are plenty of other options though, so my advice is to arrive hungry and try to mix up your order. Having said that, I’ve still never had a bad meal at Hawksmoor and we will be back.